Pour some tap water into a large bowl, and place there ground meat for a few minutes to wash it a little bit. Then drain the water. Peal and wash potatoes, onion, and garlic, and shred them into the bowl with the ground meat. Add bread to the mixture, and crack an egg there as well. Salt and pepper the ingredients by taste. For a better orientation, you need to put at least one tablespoon of salt otherwise it may not taste as good as expected. Mix all the ingredients together well few minutes by hand. The mixture should be sort of moist, so pour milk into the bowl along the way and blend everything thoroughly. If you feel that the mass is too wet then it might be necessary to add some more bread or flour. Wash well and grate a tomato and carrot into a glass baking pan. Pour to the ingredients water and blend them together. Add to the glass baking pan ketchup and barbecue sauce. Add salt, sugar, and pepper. Mix the mass well again. Form meatballs about a size of a baseball. In order to prevent sticking meat to your hands, pour some warm water into a separate bowl and wash hands there each time before forming a new ball. 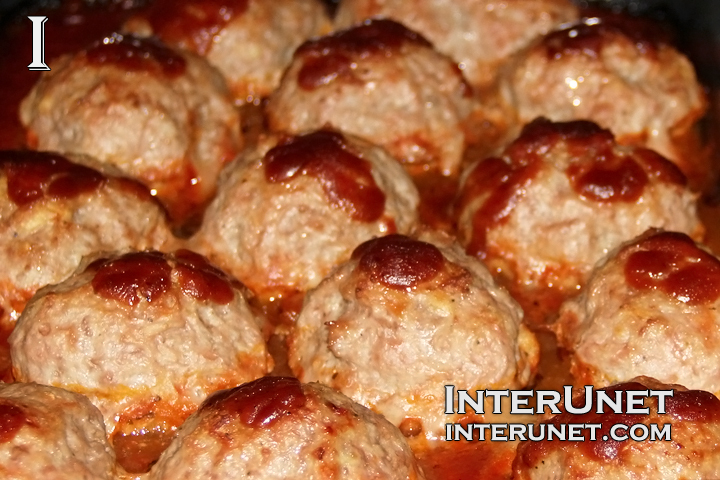 Pour some barbecue sauce on top of each meatball and place the glass baking pan into the oven for about an hour. The meatballs should turn golden brown to know that they are ready.